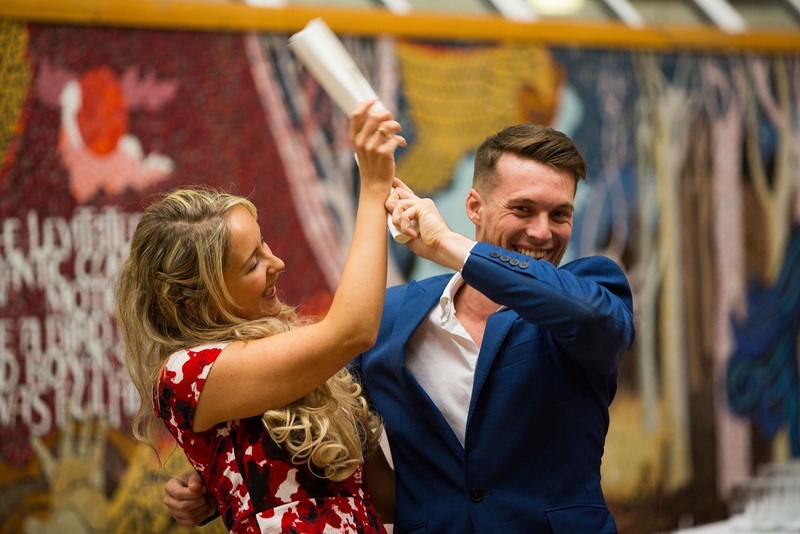 More than 400 University of Limerick students were honoured at the 7th annual President’s Volunteer Award (PVA) ceremony held in the University Concert Hall today (September 28). The students completed more than 22,000 hours of voluntary work across a range of civic and charitable organisations during the last academic year. In total, 401 people applied for this year’s PVAs, from across the student body, including undergraduate, postgraduate, mature and international students. Speaking at the event, UL President, Doctor Des Fitzgerald said: “The value of engaging with our external communities is a strong ethos at UL consequently we are leading in encouraging and recognising the volunteer efforts of students. We are the only Higher Education Institution in the country to structure student volunteering so that the significant contribution they make to our communities is recognised and acknowledged on their transcript. “Not only have they made a tremendous difference to others, many of them will have gained valuable practical experience that will stand to them as they continue in education and graduate into the workforce,” he added. “We live in a fast-paced, time-poor society, so it is hugely heartening to see so many of our students commit their time to volunteering for the purpose of making a difference in the world, and that is what we are acknowledging and celebrating today,” Dr Fitzgerald continued. The PVA programme was established in 2010 to encourage students to engage with their communities and become lifelong believers in social responsibility. Addressing the students at the event was Aoibheann O’Brien, UL graduate and co-founder of Dublin-based social enterprise, FoodCloud, who emphasised the importance of volunteer work. “There is more than enough food being produced to feed the world’s population of over seven billion people, but food loss and wastage affects 40 percent or more of the total amount of food produced,” she said. “When we set up FoodCloud, we saw a great opportunity to connect businesses with surplus food to charities that need it. Now, with over 23 million meals redistributed to over 6,000 charities in Ireland and the UK, we work with amazing volunteers, partners, retailers, supporters and professionals to help Ireland become part of a world where no good food goes to waste. We couldn't do what we do without our volunteers. They make FoodCloud happen,” Ms O’Brien commented. This year’s students who received PVAs are from countries including Spain, Canada, China, Bangladesh, France, Germany, India, United States, Saudi Arabia, and Italy. Nicholas Broderick, a fourth year business studies student from outside Mullingar, Co. Westmeath, volunteered with the Greater Chicago Chapter of the American Red Cross. “My experience has completely changed my outlook on volunteering. I now realise that a person does not need to possess a certain specialised skillset in order to volunteer. Volunteering can be done by any individual who wants to contribute to society. I feel that I was able to make a positive impact with a global relief organisation with very little previous experience in the field. I never would have imagined the type of volunteering experience I received during my time with the Red Cross, but I feel I benefitted greatly as a result of it. I would highly recommend any student to volunteer with any organisation,” he said. UL is committed to continuing to grow the number of student volunteers, not just in the university but throughout all higher education institutes (HEI) in Ireland. UL’s Community Liaison Officer, Gabriella Hanrahan, worked with colleagues in NUI Galway Alive programme, Dublin City University in the Community and Campus Engage in setting up StudentVolunteer.ie, a national online platform which enables community organisations on and off campuses across Ireland and beyond to engage directly with student volunteers. “The PVAs have publicised the willingness of our young people to give back to their society. This is not something that we acknowledge and celebrate readily. Maybe we do not have enough platforms that celebrate youth culture,” Ms Hanrahan said.